SACRAMENTO, Calif. (AP) — Donald Trump's election as president is giving a big social-media boost to an unlikely effort in the nation's most populous state: a plan to vote on seceding from the union. The Yes California Independence Campaign hopes to put a question on the November 2018 ballot that would authorize a statewide independence vote for spring 2019. The effort drew little attention until Tuesday's election, which also kept Trump's fellow Republicans in charge of Congress and raised the possibility of a conservative shift on the U.S. Supreme Court. Campaign President Louis J. Marinelli said the election results offer further proof that California is more progressive than the nation as a whole. Voters endorsed ballot measures that included recreational marijuana and increased taxes on the rich. Many Californians were offended by Trump's statements on immigration and other issues. "People are starting to come to the realization ... 'Wait a minute, this is not the type of country we want to live in,'" said Marinelli, who lost a primary bid for the state Assembly this year. As election results rolled in, the group's Facebook contacts grew from about 11,000 to about 15,000, and its email account received about 3,000 messages. Marinelli said he couldn't keep up with the Twitter messages. The next day, the group set up a tent outside the state Capitol in Sacramento. About a dozen supporters wearing YesCalifornia.org T-shirts talked to passers-by. "It would frankly be better off if we were our own nation," said the group's vice president, Marcus Ruiz Evans, calling Trump's election further evidence that America is a sinking ship. "Our ship can sail on its own." Skeptics, like Steve Angel of Sacramento, criticized what he said is an effort to "balkanize" the United States by breaking it into pieces. To the north, in Portland, Oregon, two residents filed a separate petition for a 2018 ballot initiative for Oregon to secede. Any effort to get an issue on the ballot requires the gathering of hundreds of thousands of signatures. Marinelli tried unsuccessfully to put several initiatives on the ballot this year, including a proposal to declare California a separate nation, to rename the governor the "president" of California and to fly the California state flag atop the United States flag. Those signature-gathering efforts fizzled. 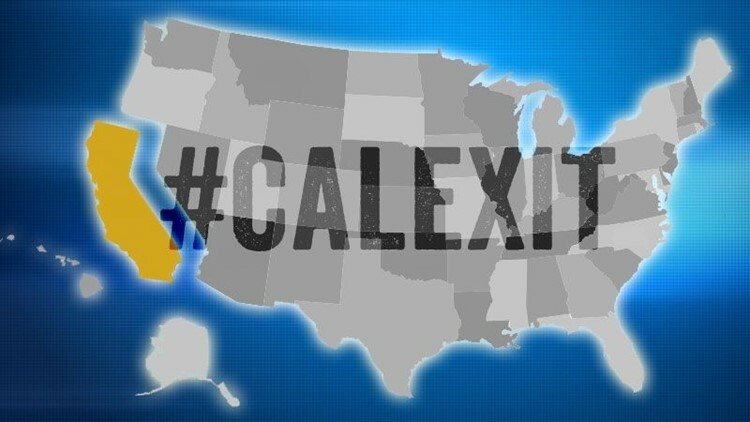 Repeated attempts to create a 51st state in Northern California, named the State of Jefferson, have also failed. That movement generally draws more conservative supporters who are dissatisfied with California's dominance by Democrats. The Yes California Independence Campaign tries to appeal across the political spectrum but holds a generally progressive ideology, Marinelli said. Marinelli equates the movement's longshot chances to the recent decision by the United Kingdom to leave the European Union. "People said Brexit wouldn't happen, and then they said Trump wouldn't happen ... Things that you don't expect to happen are happening, so why not this?" he said. Supporters of the initiative note that California, with its 39 million residents, is often compared to other nations, not other states. Data from the World Bank show its economy was equivalent to the sixth-largest in the world last year. Threats to secede from the United States have been a part of American politics almost since the nation was founded. The most serious attempt came before and during the Civil War, when 11 Southern states left to form the Confederacy. The movement ended with the defeat of Confederate forces. Chapman University law professor Ronald Rotunda said the Constitution does not provide for state secession, so the only way to do it legally would be to change the Constitution — an act that requires the approval of Congress and 38 states. "It's not going to happen. You're not going to find 38 states," he said. "The theory of our Constitution for over 200 years is we sink or swim together."